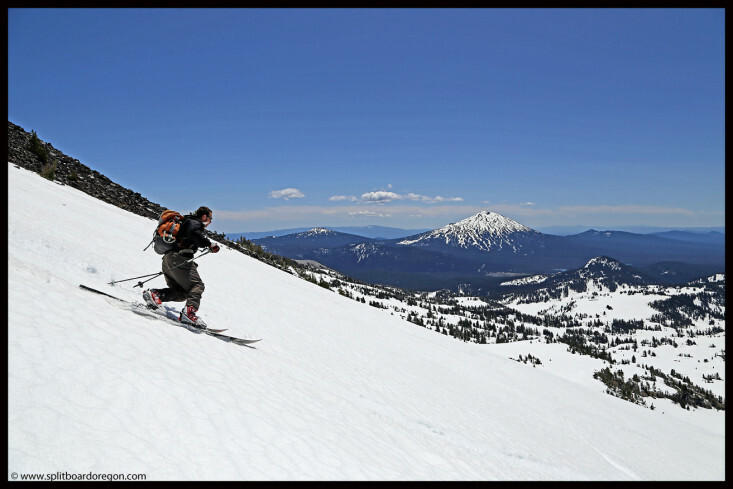 The weather forecat for Saturday was calling for sunshine and high pressure, which meant the excellent corn snow conditions we’d been experiencing in the Oregon cascades would continue into the weekend. 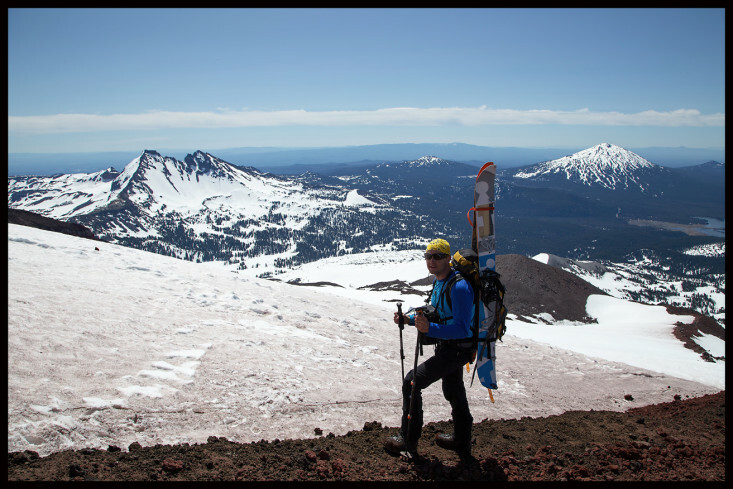 A quick phone call to Joe confirmed he was game for some turns, and since I only had a day to spare, we settled on South Sister as an objective. I hit the road on Friday evening after work, making the drive up Highway 58 and stopping for a quick bite in Oakridge. 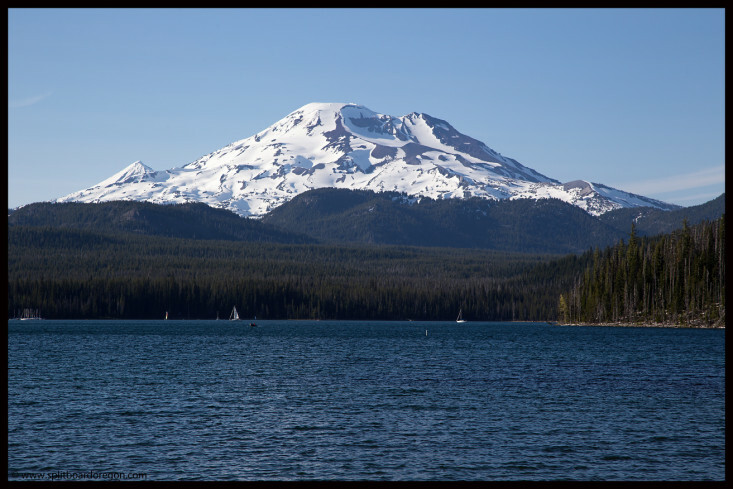 Soon, I was cruising north on the Cascade Lakes Highway and enjoying the views of Middle Sister and Mt Bachelor. With a few minutes to kill before meeting Joe, I pulled into Elk Lake and snapped a few photos of South Sister, and scoped out the conditions on the south side for our next day’s adventure….. 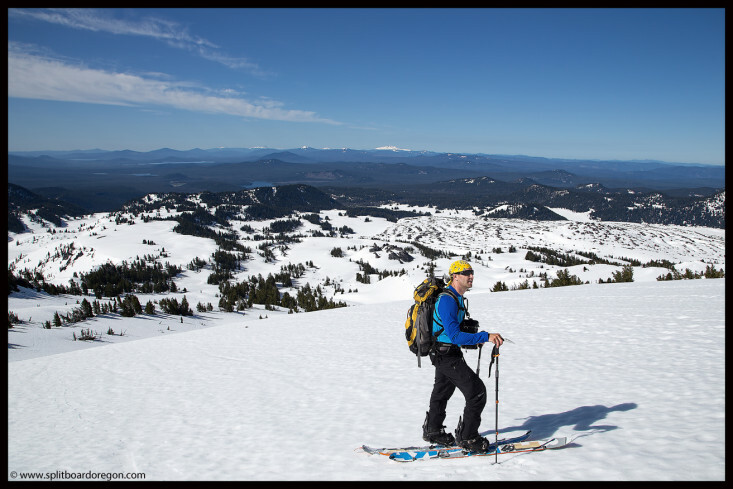 When I arrived at the Devils Lake trailhead, I found Joe relaxing in a chair and sorting his gear after skiing Mt Bachelor earlier in the day. Once situated at camp, I made sure my pack was in order for the following morning before heading out to take a few photos in the evening light. 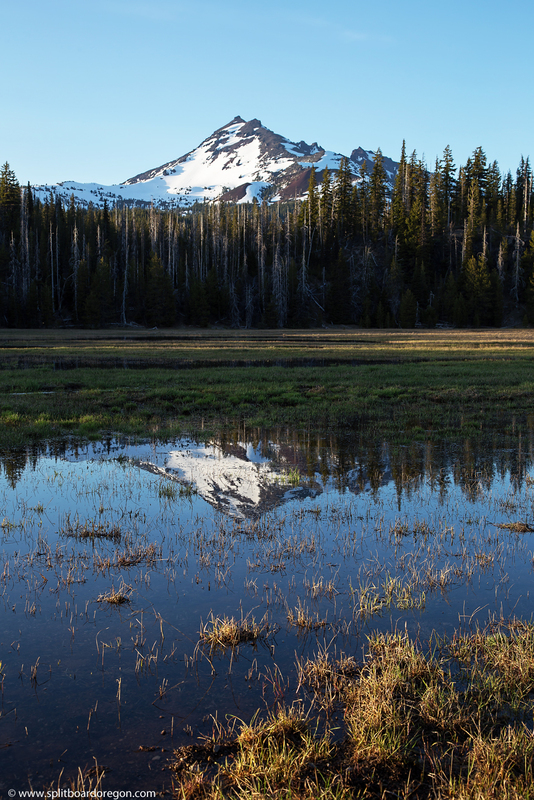 I headed up the road towards Bachelor not sure what I wanted to shoot, but found a nice reflection of Broken Top in the snowmelt just to the north of Sparks Lake. I immediately regretted not packing my tripod, but was able to make a few photos work by hand holding. While shooting, I ran into a photographer named Kevin Mikkelsen from Utah who regularly shoots landscapes and scenery in the west. Check out his website at www.photographyoutdoors.com – his work is excellent. With my photo shoot over, I made the short drive back to Devils Lake and hopped in the sleeping bag in preparation for the morning climb. We were up around 5:30, had a quick breakfast, and hit the trail. 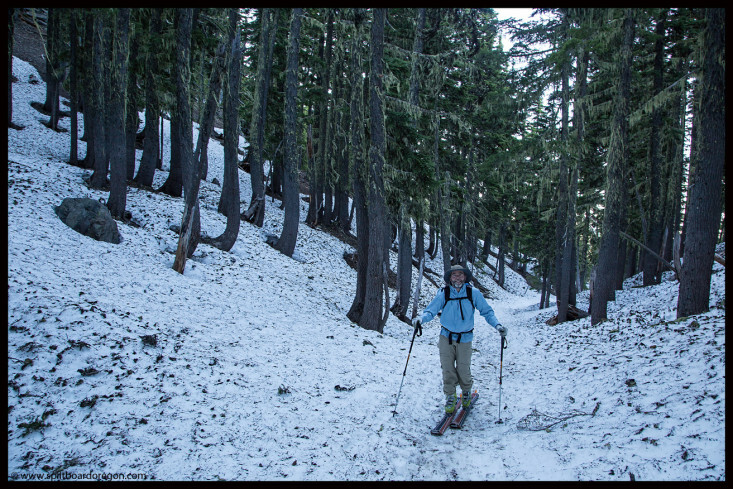 After about 30 minutes of hiking over intermittent snow and dirt, we gained a flat along Hell Creek where continuous snow allowed skinning. The sun was peaking through the trees on the approach, and every now and again we got glimpses of the snow covered Mt Bachelor, which looked like it would still ski well into July. 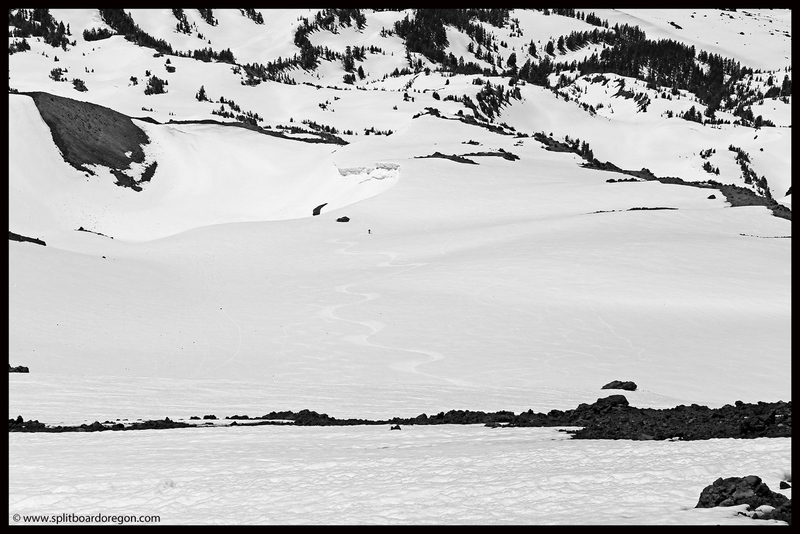 Soon, we popped out onto the flat plateau above Moraine Lake, getting our first good look at South Sister and our remaining work….. 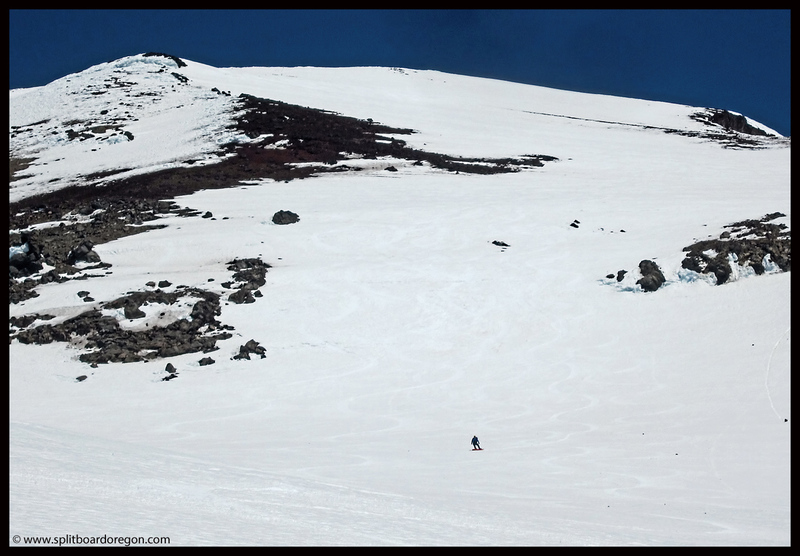 The lines on Broken Top’s west face were still looking good, and I wished we had more time for a multi-day objective. 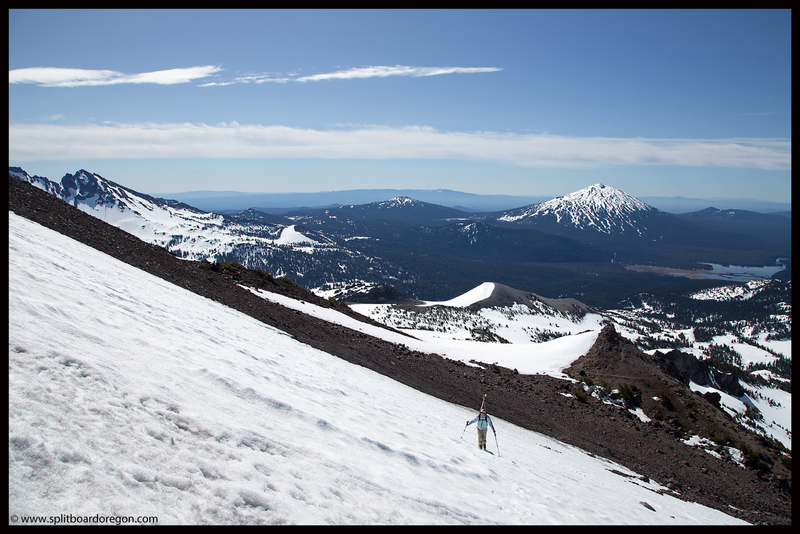 Nevertheless, we continued skinning up, and the views to the south got better and better. 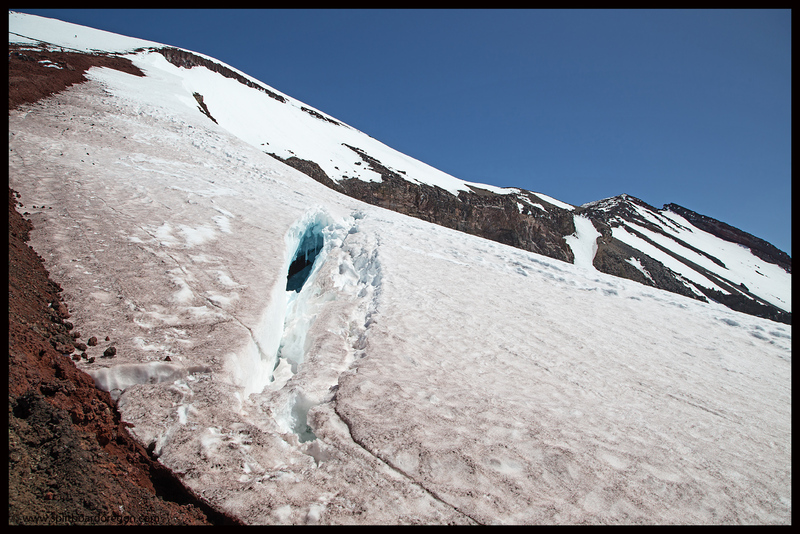 We were able to skin to somewhere in the vicinity of 8500 feet, then switched over to booting just below the base of the Lewis Glacier. 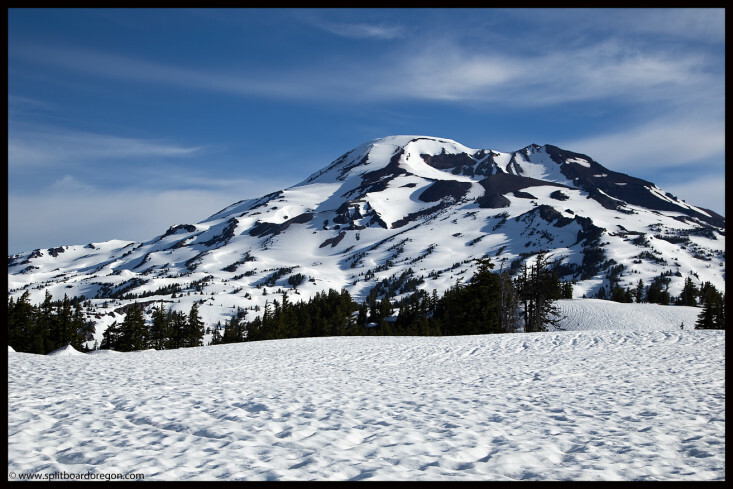 The below photos show the some of the views we enjoyed on the approach…. We were able to utilize the climbers trail along the Lewis to a point only a few hundred feet off the top. I ran into a fellow splitter named Ryan on the trail, and chatted with him briefly about our adventures at Tam McArthur Rim. Both Joe and I were feeling strong on this day, and passed several other folks on the trail up. 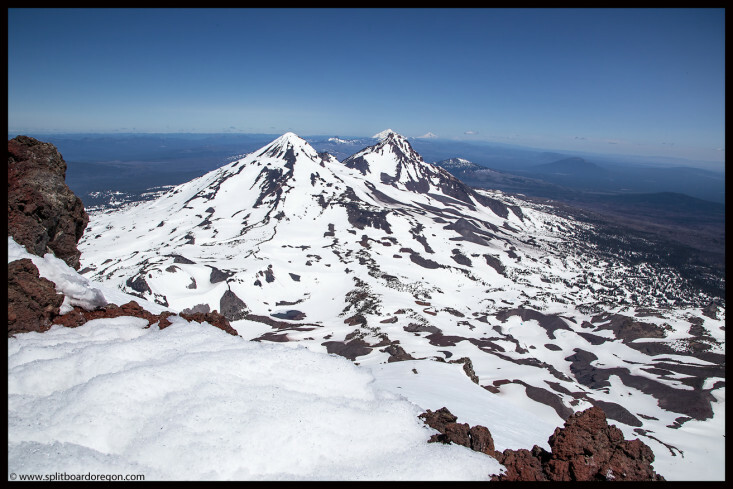 Upon reaching the summit plateau, we quickly booted across the flat towards the true summit to the north as the snow was just starting to corn, and I enjoyed the views to the west looking out towards Mary’s Peak and the valley. We reached the summit proper somewhere around 11:15, and the views to the north were stunning as usual. 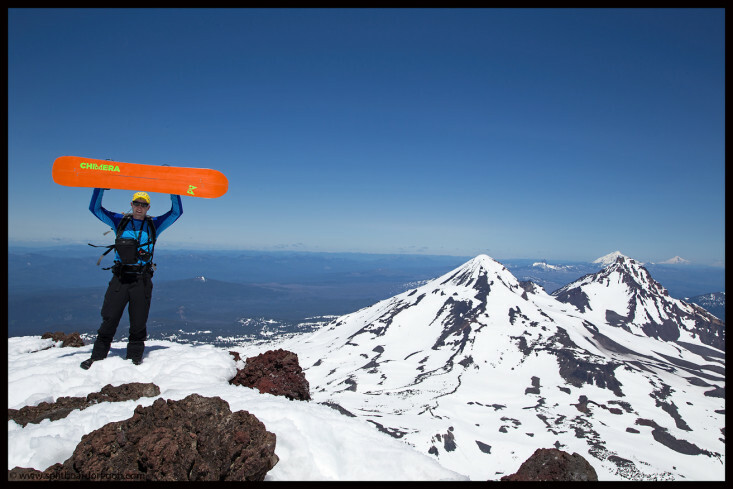 I had to perform a bit of trouble shooting on my bindings on the summit to get into ride mode, since my Karakoram SL’s were in Seattle getting a routine maintenance/rebuild (thanks Russell!). The split 30’s I was using had a slightly different fit, and I didn’t check them before I left the house (even though they fit fine on my other boards at home). Not to worry, after loosening a couple of screws with my multi-tool and refitting, I was good to go…. I took one last view north, looking out over Middle Sister and the Hayden Glacier which I’d played on a few days earlier, then pushed off and rode back across the plateau to the south side. As Joe and I were ready to shred down the south side, I heard a familiar voice say hello, and looked up to see Hensel, a friend and fellow Willamette Pass ski patroller standing there. He was also heading down, and had come up from Green Lakes, so we joined up for the ride down south side. Before we started down, we added one more to our party as well — a nice fellow from Utah who was skiing solo and asked if he could ski with us. 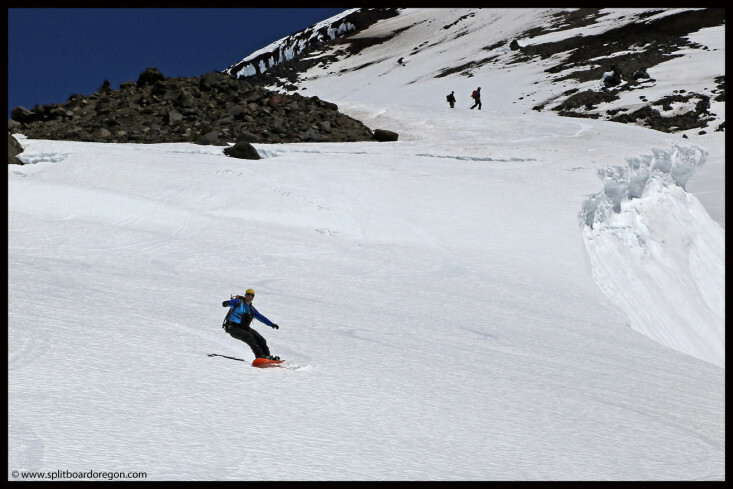 So, with a party of four, we headed down the Clark Glacier variation of the south side…..
Joe started down first, and I snapped a few photos. I thought he’d stop after a few hundred feet, but he ripped big sweeping turns down for nearly a thousand feet, clearly enjoying the corn. Hensel dropped next, followed by our new friend from Utah. Once all three were down, I dropped in. The snow was nice up top, but was really prime a few hundred feet off the top. 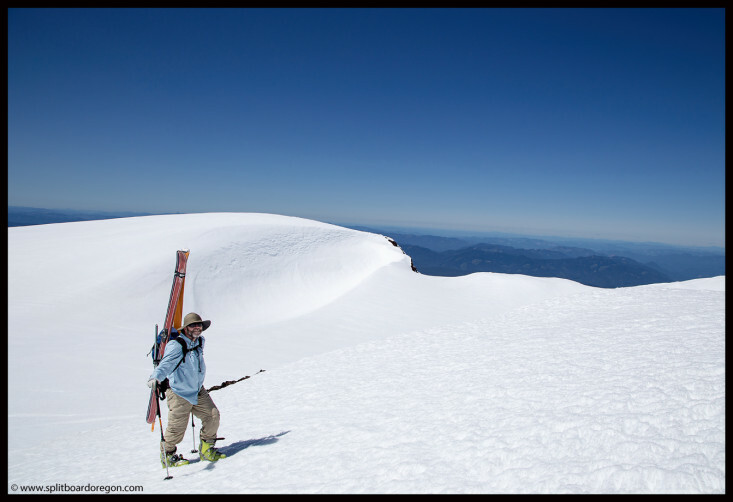 I harvested the fresh corn for nearly a thousand feet and met up with Joe, Hensel and Utah above the Clark Glacier. 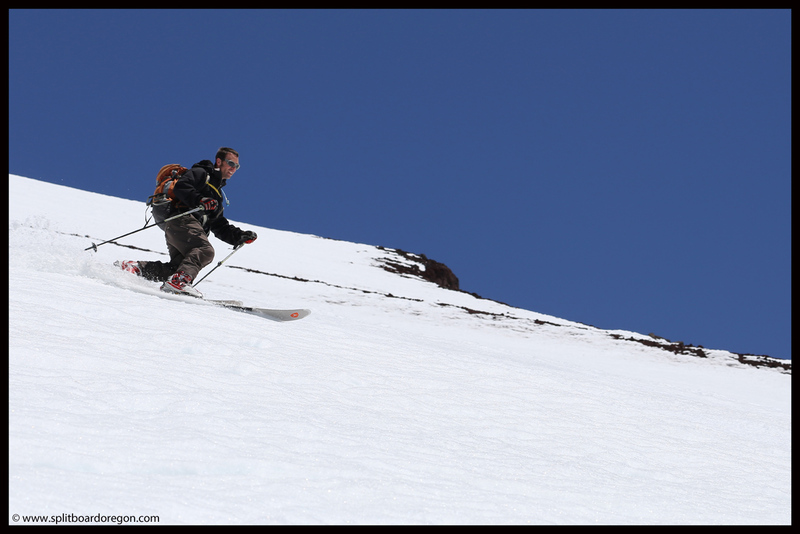 Joe snapped a few photos of me coming down…. We negotiated a small crevasse on the Clark Glacier, and continued down, enjoying corn all the way, stopping once for a quick rest of the legs. It appeared we were the first folks down this way on this day, as no other fresh tracks were on our route…. 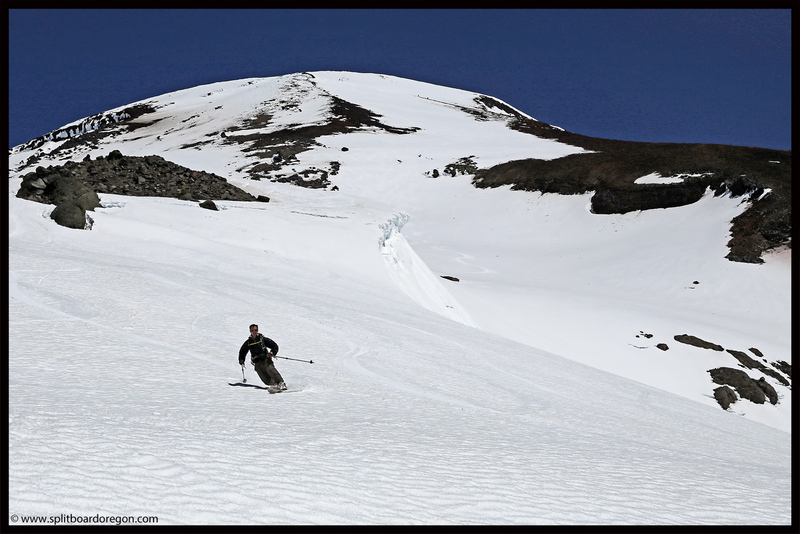 We continued to the flat below, riding as far as gravity would allow, then switched back to skins for the ski out across the flat. 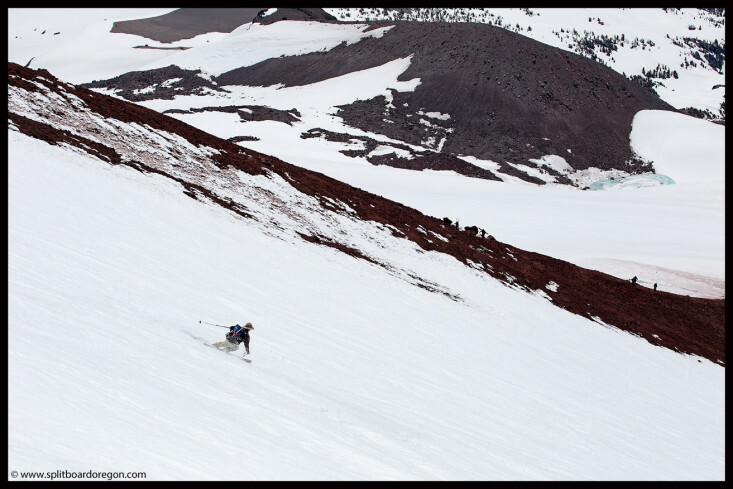 The ski across the flat above Moraine Lake is always hot and punishing after a long day, but wasn’t too bad on this day. At the top of Hell Creek, we were able to ski out through the trees to a point where we only had a five minute hike or so to the car — not too bad for June. Back at the car, we made the short drive to the Green Lakes trailhead, to drop Hensel off and enjoy a well deserved micro brew along with a variety of snacks and food, including the obligatory chips and salsa. Driving home I was stoked to have enjoyed such a great day in the mountains with friends. I wished I had thrown in my fishing pole however, as the water of the upper Deschutes was looking pretty inviting, but that would have to wait for another day and adventure.